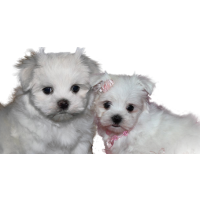 • Maltese dog breeders are listed below alphabetically by State / city. 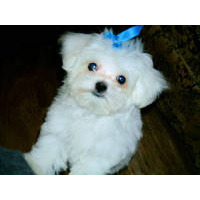 • Click on underlined words to find Maltese puppies for sale. • Please tell the Maltese breeders with puppies for sale that you found them on BreedersClub.net. 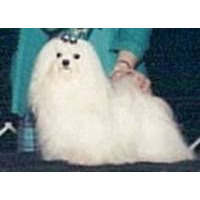 The Maltese breed belongs to the Toy Group of AKC, has long white silky hair and has a lively yet affectionate temperament. They are very popular as family companions as they are both affectionate and playful. Maltese are gentle mannered but they are also fearless. Thier coat needs daily brushing and periodic grooming. Champion bloodlines - Tiny AKC Registered Puppies for Sale in Nevada, convenient to Bullhead City Arizona and delivery is possible in some areas - These beautiful, dollface puppies are home raised, loved and socialized to make a perfect, loving addition to your family. Health guaranteed. Our babies are already housebroken to piddle pads and are well socialized. Our babies have had at least 2 sets of shots and wormning and come with a ONE Year written HEALTH GUARANTEE ! We even provide a FREE Puppy Starter Kit to get you started with what they need. WE DO NOT SHIP OUR BABIES. It is our goal to provide the finest puppies available to loving, dedicated homes. Our puppies come with a written one-year health guarantee and receive the best of preventative “well-puppy” care before they go to their new homes. They are checked and approved by our veterinarian, and are current on all vaccinations. Our puppies are family raised with lots of love, are very well socialized, and love people. AKC Registered puppies, adorable & bred to the standards for show to pet quality for 14 years. My puppies have loving, sweet, gentle dispositions & are healthy with small baby doll faces. They are raised at home with lots of love. Vaccines and worming kept up to date, contract with health guarantee provided. I do not ship my puppies. Please visit to see available pups and details: We are located in New Hampshire, convenient to Massachusetts. 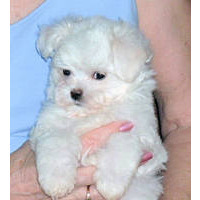 This breed directory page features Maltese breeders with puppies and/or adult dogs for sale. Once you purchase your new found friend, you will want to provide it the best in pet health care. Be sure to visit our online discount pet supplies catalog and order NuVet Plus™ to keep your puppy and adult dogs in top condition. The discount catalog also features collars, leashes, carriers, general pet care products and much more. BreedersClub.net does not pre-screen the Maltese breeders who advertise their puppies and dogs for sale in the BreedersClub.net breeder directory and in the classified ads. We require all advertisers to agree to our advertising terms. You should ask the Maltese dog breeders you talk with for references from past buyers and veterinarians.